High 5 Moment: September 2017 Statistics! Hey, High 5-ers! October is here and the fall weather is upon us. 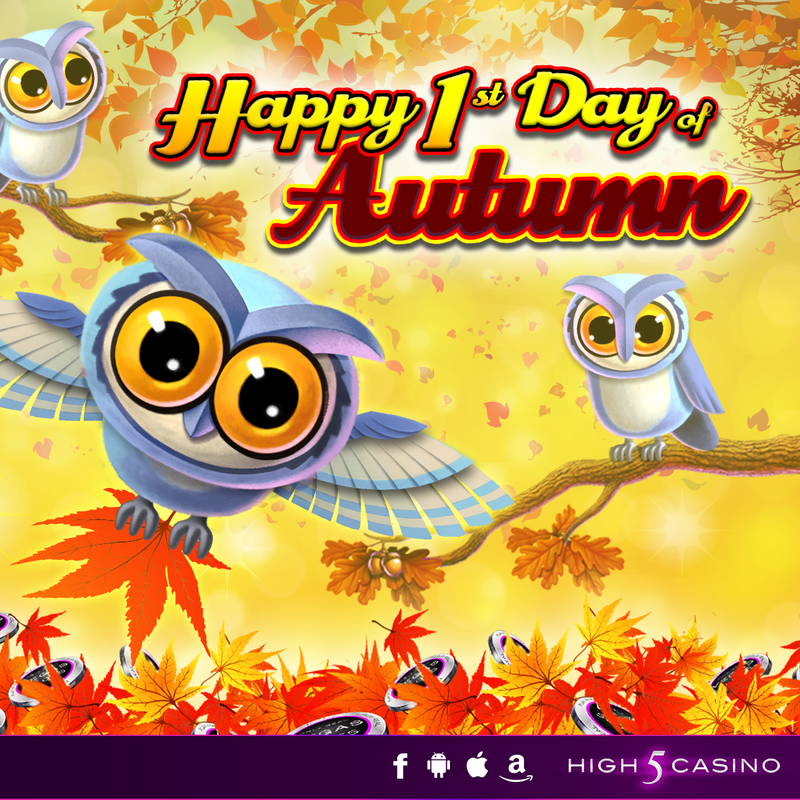 We prepared for the season with a busy September month at High 5 Casino! We kicked off September by celebrating our Five-TASTIC anniversary! The celebration began with players being asked to vote for their favorite slot game from a selection of 10 by playing it! The 5 most played games were selected for a 5XP event or 5X Game level rewards! Games that were featured for our Five-Tastic Anniversary included Secrets of The Forest, Lucky Horse, Gypsy, Golden Knight and Kiss of the Rose! 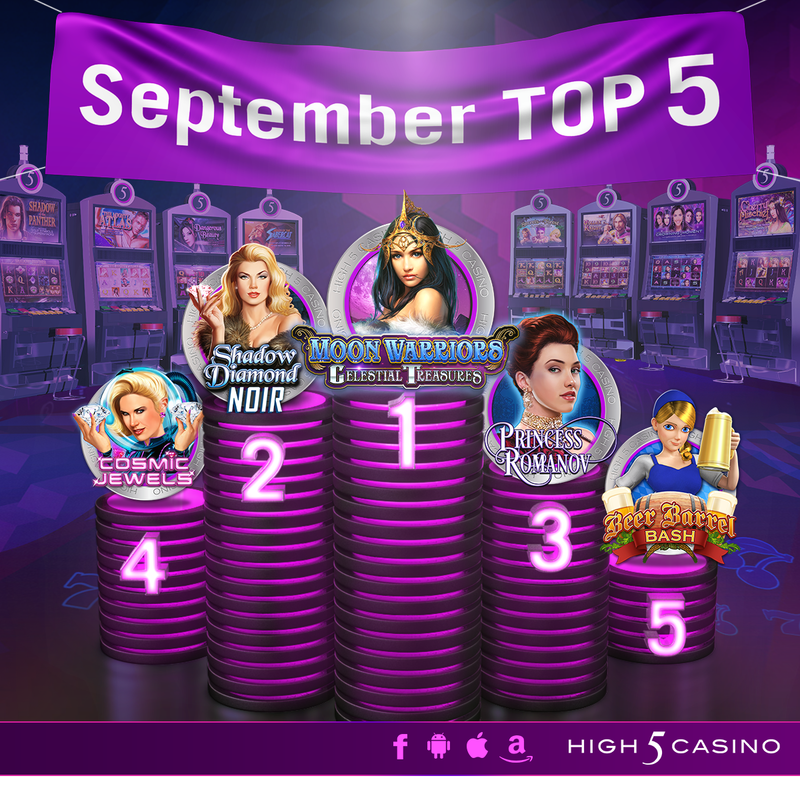 September also brought a number of new games to our casino library: Teddy Bucks, Black Sail Beauties, Time and Again and Tiny Treasures! High 5-ers took advantage of our weekly XP events where they were able to level up 2X to 5X FASTER in select slots! You gave us some suggestions, and we listened! This month, Raffles are now offered more than once to give players an extra opportunity to earn more FREE COINS! To enter, players are invited to play the designated game for four hours and are required to bet a minimum amount in accordance with their VIP tier. Only one winner is selected from each VIP tier for a total of seven winners! Raffles this month included the Kings of Gibraltar Raffle, the La Torera Roja Raffle and the Empress of Josephine Raffle! September sure did not disappoint! With new games, our 5-year anniversary, XP events and Raffles, High 5-ers walked away with over 56 TRILLION coins spinning over 3 THOUSAND hours! This month, we want to give a special shout-out to the High 5-ers who had major High 5 Moments with the TOP 5 BIGGEST WINS! Most-played tournament: Three Graces Prize Party! 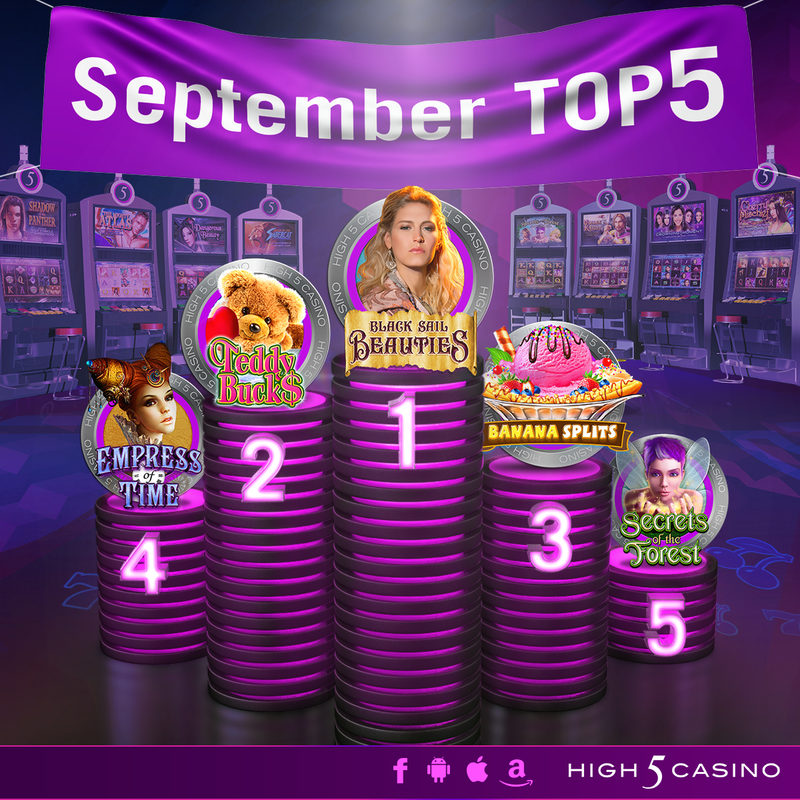 Top 5 most played games for September: Black Sail Beauties, Teddy Bucks, Banana Splits, Empress of Time, Secrets of The Forest! Which game gave you your High 5 Moment in September? Did you enjoy our new game raffles? Comment in the conversation bubble located on the top right corner of your screen and let us know! It’s time to break out your cozy boots, scarfs and jackets because the cool weather is officially here. We all know, Starbucks and Dunkin Donuts started offering pumpkin spice lattes at the beginning of the month but you can keep enjoying pumpkin spiced everything while participating in fall activities! Our favorite fall activities are apple and pumpkin picking and admiring the changing colors in the leaves! With Autumn in full swing and Halloween right around the corner, we’d like for you to vote for your favorite fall game. Vivaldi’s seasons is a favorite throughout the year as you can travel through the hope of spring, the power of summer the chill of winter and the beauty of autumn. The seasons resonate with people, as does the classic work by the great Italian composer Antonio Vivaldi. Vivaldi’s Seasons features Super Stacks, a proven feature with slot enthusiasts. With Super Stacks, long stacks of symbols are more prone than ever to show up on reels to create big wins. The game also offers the Pick-A-Super-Stack feature, which incorporates player choice in the free games bonus. With the cool weather upon us Birds of Prey are stepping up their hunt as, food supply is scarce. The hunt is on. Hovering above its prey, the predator bides its time, waiting for the perfect moment to strike… Soaring Wings is a riveting slot game that depicts some of the deadliest birds in the sky as they scan the terrain below for their next meal. With a hefty top bonus of 10,000 credits for 5-of-a-kind wilds, you too can feel like you’re flying high in Soaring Wings. This game also features Split Symbols, which gives players the chance to get up to 10 symbols on any given line because any one spot can contain two symbols. With Halloween right around the corner and the Walking Dead season 7 premiering in October, what better way to celebrate than by playing Zombie Zone! The zombie apocalypse is upon us! The undead have arisen and are hungry for brains. Band together with other survivors and maybe you’ll stand a chance. To survive, you’ll have to fight your way out of the Zombie Zone! 4 x 6 reels. 50 paylines. Super Stacks. Which is your favorite game to play during the autumn? Comment in the conversation bubble located on the top right corner and let us know.